The Consumer Rights Act 2015 gives you important rights when you make a contract with a trader for the supply of goods, services and digital content. Having a clear understanding of your rights is the first step to becoming a confident consumer. Knowing how to put that knowledge into practice when things go wrong is the next step. This guide gives you an overview of the key rights you have when a trader supplies goods to you and a clear pathway to follow if you want to complain to the trader about those goods. Before you approach a trader with a complaint about goods that have been supplied to you, know your rights and make sure you have a clear understanding of what you are entitled to and when you are entitled to it. 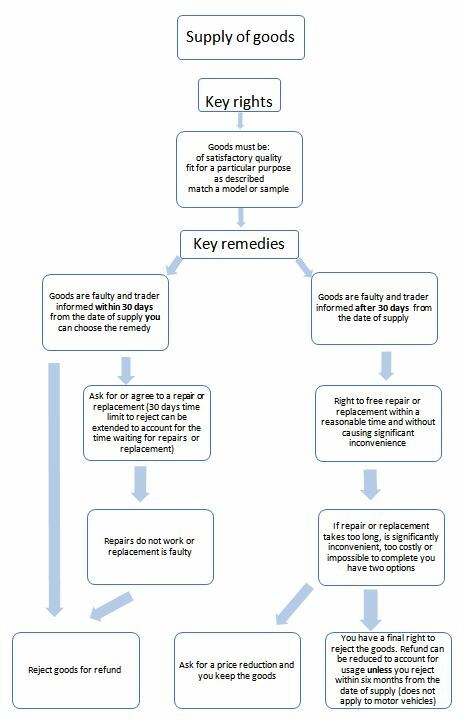 The chart below gives you an at-a-glance view of your key rights and remedies when goods are not of satisfactory quality, not fit for a particular purpose, not as described and when they do not match a sample or model. If you need it the 'Sale & supply of goods: your consumer rights' guide gives more in-depth information. if you complain by phone, ring the dedicated customer services helpline number if there is one. Make sure you are given a complaint reference number. Alternatively ring the store or head office and ask to be transferred to someone who can help you. Ask for their name and contact details in case you need to speak to them again. when you complain in person or by phone, it is advisable to follow-up with an email or letter to confirm the details of your complaint, which remedy you are seeking and to give a deadline for the trader to respond. For further information in England and Wales contact the Citizens Advice consumer service on 03454 040506. In Scotland contact Advice Direct Scotland on 0808 164 6000. Both provide free, confidential and impartial advice on consumer issues. ©2019 itsa Ltd on behalf of the Trading Standards Institute.